Recognizes endogenous levels of FPR1 protein. KLH-conjugated synthetic peptide encompassing a sequence within the center region of human FPR1. The exact sequence is proprietary. Shipped at 4 degree C. Upon delivery aliquot and store at -20 degree C for one year. Avoid freeze/thaw cycles. Small volumes of anti-FPR1 antibody vial(s) may occasionally become entrapped in the seal of the product vial during shipment and storage. If necessary, briefly centrifuge the vial on a tabletop centrifuge to dislodge any liquid in the container`s cap. Certain products may require to ship with dry ice and additional dry ice fee may apply. 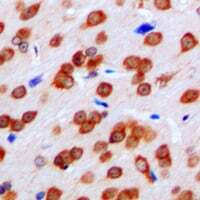 Immunohistochemical analysis of FPR1 staining in human brain formalin fixed paraffin embedded tissue section. The section was pre-treated using heat mediated antigen retrieval with sodium citrate buffer (pH 6.0). The section was then incubated with the antibody at room temperature and detected using an HRP conjugated compact polymer system. DAB was used as the chromogen. The section was then counterstained with haematoxylin and mounted with DPX. NCBI/Uniprot data below describe general gene information for FPR1. It may not necessarily be applicable to this product. FPR1: High affinity receptor for N-formyl-methionyl peptides, which are powerful neutrophils chemotactic factors. Binding of FMLP to the receptor causes activation of neutrophils. This response is mediated via a G-protein that activates a phosphatidylinositol-calcium second messenger system. Belongs to the G-protein coupled receptor 1 family. 1. A low FPR1/beta1 integrin co-localization was observed.